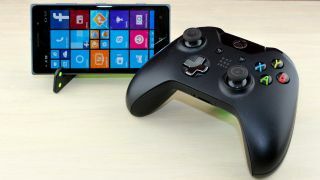 Windows 10 Mobile preview is saying "Xbox On" in the latest update for its phones and tablets software. Microsoft's operating system beta lets Xbox Live gamers dive into their achievements, friends lists and Games DVR clips. Ensuring that you'll never miss a moment with messages and alerts directed at your gamertag are here too. Notifications include activity alerts and messages. More Xbox One functionality is promised in the coming week, including OnGuide integration and live TV streaming, according to Microsoft's official release notes. It's not all fun and video games, though, as Universal Office apps are included in this build. Starting today, you can download Word, Excel, PowerPoint and OneNote preview apps. Office on Windows 10 Mobile promises on-the-go productivity with touch-first capabilities meant for viewing, quick edits, notes and mark-up. All new apps can be found in the Windows Store, which has undergone a redesign in this build, as have the newly available Video Preview, Music Preview and camera apps. Microsoft is opening the Windows 10 Mobile preview up to new testers willing to download an unfinished pint-sized operating system. It has stripped away the Nokia branding from the Lumia 930, Lumia Icon and Lumia 640XL, but it's adding the beta to these smartphones - a fairly good trade-off for early adopters. HTC One M8 Windows Phone owners are also able to download Windows 10 Mobile, though Microsoft warns that it's filled with "known issues" for all phones. The release notes point out a critical bug in which MMS messages may never be delivered and apps like Twitter may crash upon booting up for the first time.